The Pied Wagtail (Motacilla alba yarrellii) is one of our more widespread and common breeding birds. An elegant black and white bird it lives up to its familiar name of Willie Wagtail. The systematic name yarrellii is after the nineteenth century English Naturalist William Yarrell. He aptly wrote “deservedly admired for the elegance of its form. As well as for the activity and airy lightness exhibited in all its actions. It is ever in motion, running …in pursuit of its insect food, moving from place to place by short undulating flights…alighting again on the ground with a sylph-like buoyancy”. 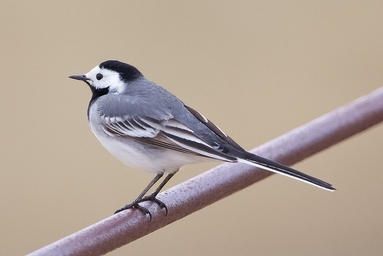 The Pied Wagtail breeds almost entirely within the British Isles and is a subspecies of White Wagtail (Motacilla alba) which breeds from Iceland and the Faeroe Islands throughout Europe to the Urals. White Wagtail can also be seen on Arran. The spring is a good time of year to look for this species. It is a common passage migrant in spring and autumn and is most frequently recorded on the shores on the south and west of the island. The first spring records are often in March with the peak in mid to late April continuing into May. These are thought to be birds making their way to Iceland to breed. Adult males of Pied and White Wagtail are relatively easy to tell apart in their breeding plumage. The male Pied Wagtail has a black back so black is continuous from the crown to the bib. In addition in Pied Wagtail the flanks are dark grey with contrasting white under-parts. 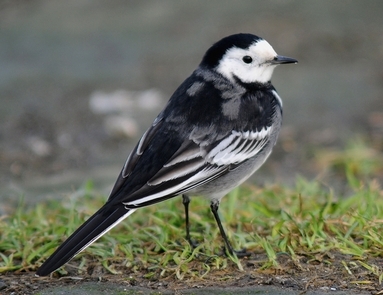 In the male White Wagtail the black crown and black bib are not joined up. The back of the White Wagtail is a pale ash grey which contrasts with the darker wings. In addition the flanks of the White Wagtail have just a very pale grey wash so the flanks and white under-parts have less of a contrast giving a white appearance on the side at a distance. Check out the photographs. The Pied Wagtail is on the left and the White Wagtail on the right. This said the differences in the plumage of males, females and juveniles at different times of the year are quite complicated. For more informatiom on separating White and Pied Wagtail click here.